GMES & Africa is a cooperation framework for the development and implementation of Earth observation based services that support sustainable development in Africa. One of the pillars of the cooperation is the European Copernicus programme (formerly GMES), which constitutes a major source of data, information and technological expertise. 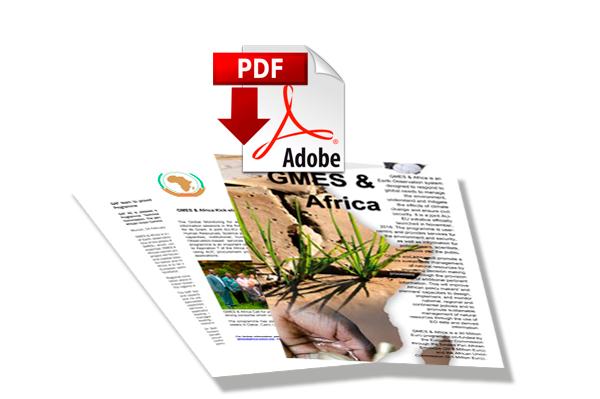 GMES & Africa will cover the entire African continent and will be guided by African-owned processes in order to serve African needs. The GMES & Africa Support Programme will focus on improving the sustainable management of natural, water, marine and coastal resources through the use of Earth observation technology. This will allow for better and more informed decision making and will assist policy makers. GMES & Africa is to be implemented by a network of African institutions in cooperation with European partners. The African Union Commission has the role of coordinator and facilitator. The general objective of the programme is to promote the sustainable management of natural, water, marine and coastal resources by providing evidence-based interventions to provide information for decision making processes. The specific objective is to improve African policy-makers’ and planners capacities to design, implement, and monitor national, regional and continental policies and sustainable management of natural, water, marine and coastal resources through the use of EO data and derived information. Access to Earth Observation (EO) data is maintained, improved and sustained. An EO based information service for monitoring and management of Water and Natural Resources adequately informs policy makers and end users. An EO based information service for monitoring and management of Marine & Coastal environments adequately informs policy makers and end users. Capacities of African public institutions and the private sector to deal with EO-based information for Land and Marine & Coastal applications are enhanced at regional and national level. Policy makers, administrators, entrepreneurs, scientists and civil society active at regional, national and local levels in Africa are aware of opportunities provided by EO data and geospatial information technologies. On request and for specific tasks this core team is supported by additional experts . The TAT has started in January 2017 and has a duration of 46 months. The project is funded by the European Union as part of EuropeAid, under Contract Number 380768.
i) to provide technical contributions on the two services and their applications, ii) to provide technical contribution to the other tasks to be achieved by the AUC (e.g. training and infrastructure) and iii) to support AUC in fulfilling its role of Project Coordinator. The consortium combines the experience and capacities of 3 partners: GAF is a European leader in end-to-end services in the field of Earth Observation, geoinformation and its applications. AHT is a leading service company in the domains of water resources management, natural resources management, agriculture and nature conservation. BRL Ingénierie has leading experience in the management of coastal and maritime areas and the environment, and of dealing with water resources, land and natural resources. The project is funded by the European Union as part of EuropeAid, under Contract Number 380768.